That both heaven and hell are a Chinese banquet says a lot about Chinese values. For one, it's about food, which, as anyone with much experience of Chinese culture knows, is of paramount importance. And second, it points to the importance of relationships in the Chinese mindset. ''A banquet is very important [because] it reflects the collective culture ... The formal procedure shows the hierarchy of society,'' says the general manager of Sydney University's Confucius Institute, Xing Jin. A prime example is how social hierarchy underpins the seating arrangement at a formal banquet. The guest of honour is given the best seat in the house (usually facing the door because this is good feng shui) and others are seated closer or further away from the honoured guest in order of importance. As a child of Chinese Malaysian parents, the Chinese New Year banquet was something to love and loathe. I liked having lots of food to eat; I disliked adults putting gross-looking food on my plate. I liked going out to a fancy restaurant with huge chandeliers; I disliked the formality and tension of the banquet. I liked spinning the lazy Susan; I did not like when it stopped with the dead eyes of the steamed fish staring at me. Mostly, things happened around me, governed by a mysterious and frustratingly uncompromising (il)logic. For instance, why could I not start eating before my grandfather had started, even though the food was on the table, I was hungry and he was clearly engaged in conversation? Why did I have to give food to the uncle I had never met before, even though he was clearly capable of getting it himself? The teachings of Confucius, who lived in an era of turmoil in China's history, aimed to establish a set of moral guidelines to underpin the harmonious social order. All the food at a banquet is shared and usually one person will order for the entire table. Once the food arrives, wait for the host to serve a portion to the guest of honour or to invite the table to begin eating. Take small servings – one or two portions or spoonfuls – and take it one dish at a time, rather than piling large quantities from every plate into your bowl. Guests are expected (read: aggressively encouraged) to eat a lot, but taking food from the serving dish, which is intended for everyone to try to share, and piling it into your bowl where no one else can get at it, is seen as greedy. Don't go fossicking – or as some call it, ''grave-digging'' – for the most succulent portion of pork spare rib. Take what's closest to you and (here's a sneaky tip) if you pick up something that doesn't inspire you, place it on your neighbour's plate. Seems rude? Absolutely not. Serving others is a sign of respect and as a child, I often honoured my brother and sister with morsels of jellyfish, bitter melon and mystery sea creatures. By extension, don't be surprised to find that while you were busy offloading some rubbery fungus to the ''uncle'' you just met, a new mystery food has landed on your plate. It's all part of the circle of respect. Chopsticks can be tricky, not least of all because they look a lot like drum sticks and the banquet table like a giant drum. Perfect chopstick etiquette avoids touching the chopsticks as much as possible. 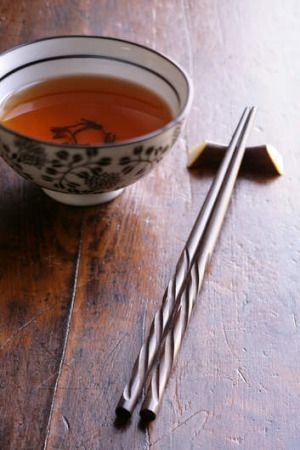 Take food from your chopsticks with your teeth and lips and use the serving utensils to take food from serving dishes. If these are missing, reverse your chopsticks and use the wider end to take food from the serving plates. Also avoid leaving your chopsticks stuck upright in your rice, unless you intend to wish death upon someone at the table. Chopsticks stuck in a bowl of rice resemble incense sticks stuck into an incense pot – something that is done when somebody dies. (Similarly, the spout of the teapot wishes death upon whomever it is pointed at.) When not eating, place the chopsticks neatly on the chopstick rest or, if there isn't one, on your plate beside your bowl. Eat heartily, try a little of everything – or, if you really can't stomach something, pretend you've already tried it – and compliment the meal enthusiastically. Remember, though, that a banquet is intended to demonstrate abundance, so leave something of each dish at the end. If every plate is licked clean, it implies the host did not provide enough food. Drinking is an important part of Chinese entertaining. Learn the words ''gan bei'' (meaning ''dry cup'' or ''bottoms up! ''), then proceed with caution. Banquets are about excess and celebration, and getting drunk is a happy part of that. Pour drinks for the people around you before pouring for yourself and offer a toast before drinking any alcohol. When clinking cups, try to lower the rim of your cup below others to demonstrate how humble you are. When someone fills your teacup, thank them in the traditional way: tapping your knuckles on the table. The gesture comes from a Chinese folk tale about a Qing dynasty emperor who was travelling in disguise with his servants. One evening, when the emperor and servants were dining together, the emperor filled his servant's teacup. Realising that he could not kowtow to express his gratitude for fear he give the game away, the servant bent three of his fingers at the knuckles and tapped them on the table. The gesture is intended to represent the head and arms of the prostrating servant. Finally, brace yourself when the waiter brings out the bill. You will be amazed at how the sight of the bill can jolt an entire table of drunk and overfed diners out of their collective food coma. Wallets will be waved, the waiter will be attacked with credit cards and money will fly in all directions as everyone insists on paying for everyone else. My advice: get amongst it. Life offers far too few occasions for throwing money in the air, knowing you'll probably wake up with it stuffed back in your pockets.